With this background in place, it is now appropriate to turn to the question of how Primates has been defined and diagnosed in the past, what the status of these past approaches is in relation to current taxonomic considerations, and the relevance of plesiadapiforms to this issue. Mivart (1873) is generally cited as providing the first coherent definition of the order Primates. Mivart listed a series of characters seen in extant Primates including features unique or unusual to Primates (e.g., hallux with a nail) together with more widely distributed features that are likely to be primitive at a lower level (e.g., scrotal testes). Le Gros Clark (1959; see also Napier and Napier, 1967) translated these features into a series of evolutionary trends, again focusing on characteristics of extant primates, and again including both unusual primate features (e.g., elaboration of visual system) and more primitive eutherian traits (e.g., preservation of pentadactyly). Martin (1968, 1986) followed a similar approach in focusing on modern primates and in using a list of characters. In contrast to previous studies, however, Martin sought to apply Hennigean principles to filter the characters so that the diagnosing list included only synapomorphies. These authors used a character-based approach focusing on extant forms. The problematic aspect of this method can be seen in the difficulties faced by Martin (1986) in trying to fit fossil adapids and omomyids into a modern conception of Primates. Some adapids and omomyids exhibit primitive features missing in all modern primates, such as the retention of the first premolar. Defining Primates based on a list of characters derived from observations of modern primates does not allow for loss of primitive traits that were present in the common ancestor. Such losses could occur either in the stem lineage leading to modern primates, or in parallel in groups that diverged off that ancestral lineage (i.e., as likely occurred with the loss of P1). Any taxonomy that makes the implicit or explicit assumption that modern primates exhaust all the forms that the group has taken in its >65 MY history are likely to fail when faced with the real complexities of the extinct species to be found in the fossil record. The approach taken by these authors is most consistent with the node-based, crown-clade method of defining taxa from phylogenetic taxonomy. Particularly, Martin requires fossil taxa to share a preponderance of features with extant taxa, indicating that they arose from the same common ancestor. Martin excluded forms (e.g., plesiadapiforms) which may lay along the stem leading to that ancestor, and which would therefore lack some or all of the features recognized in extant forms. Martin's justification for this approach is as follows (1968, p. 385): "If the term 'order' is to express anything in concrete terms, one should be able to picture a common ancestor with a distinct 'total functional pattern' at the base of each order, distinguishing this from other orders and providing the specific basis for the evolution of the descendants included in the order." Cartmill (1972, 1974, 1992) took a similar approach to the problem in advocating an adaptational methodology for delimiting major taxa, requiring that taxonomic boundaries mirror the pattern of major adaptive shifts. Under this approach plesiadapiforms could be excluded from Primates, independent of their phylogenetic position (but see Szalay, 1975), because they lack features associated with some novel adaptive complex. How this complex may be characterized so as to exclude all plesiadapiforms is becoming unclear, however, particularly in light of the discovery of some key adaptive primate features in plesiadapforms (e.g., a divergent hallux with a nail in Carpolestessimpsoni; Bloch and Boyer, 2002). The presence of arboreal features in Ptilocercus lowii, a scandentian that may be our best representative of the ancestral archontan (Bloch et al., 2003; Sargis, 2002a,b, and 2006), also complicates our understanding of the supposed adaptive uniqueness of definitive primates, since it appears that arboreality has a much more ancient origin relative to the group than had previously been assumed. The arboreal features of plesiadapiforms also underline this (Bloch and Boyer, 2002, 2003, and 2006; Bloch et al., 2003; Boyer et al., 2001; Szalay, 1975). As with the example given above relating to the genus Homo, an additional problem with this approach is that it suggests no meaningful way of reclassifying those taxa that are excluded from this privileged primate status. Particularly, Cartmill (1972, 1974, 1992) advocated removing plesiadapiforms to Insectivora, explicitly favoring their transfer to a wastebasket taxon. This approach is further discussed in later section. An additional reason why Martin (1968, 1986) felt that plesiadapiforms could be safely excluded from Primates was his opinion that they are not, in fact, the sister group of definitive (i.e., undisputed) Primates. If this is true, a good case could be made for excluding the group from the order (see a later section). Martin, however, provided no strong evidence for this, and failed to identify either a more plausible sister-group for Primates, or a more convincing alternative placement for plesiadapiforms. Hoffstetter (1977) expressed no such doubts about the sister group relationship between plesiadapiforms and definitive primates. Hoffstetter's approach was fundamentally node-based, designating Primates as the group stretching from plesiadapiforms up to anthropoids (his Simiiformes), and introducing the very useful term Euprimates for the group referred to until now as "definitive primates" (i.e., Primates of modern aspect; crown-clade Primates). MacPhee et al. (1983; see also Gingerich, 1986) also included plesiadapiforms in Primates to avoid the information loss that they felt would result from their removal (Gingerich, 1973, 1986; but see Gingerich, 1989). 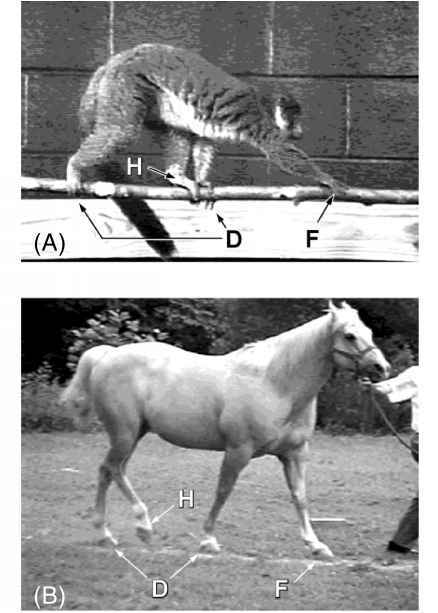 These authors differed radically from Hoffstetter in their basic approach, however, forming boundaries based on three grades separated by morphological novelties supposedly associated with changes in adaptive pattern. Their view of Primates included not only plesiadapiforms, but also potentially mixodectids, apatemyids, tupaiids, and even dermopterans. As such, these authors' scheme would allow for paraphyletic and even polyphyletic groupings, making this approach explicitly opposed to the basic assumptions and goals of phylogenetic taxonomy, so that it would be difficult or impossible to accommodate this view in the context of the Phylocode. Although this does not immediately invalidate this approach, Szalay et al. (1987; see also Beard, 1990b) make some very good points about problems with this classification. Particularly, they note that of the three "grades" recognized by MacPhee et al. (1983), the only one that was adaptively coherent was their "Grade 3": Anthropoidea. It is not clear what adaptive features are supposed to link their "Grade 1" (plesiadapiforms, apate-myids, mixodectids, tupaiids, and dermopterans) in light of the very divergent postcranial and dental characteristics in the included taxa—consider, for example, the contrasting postcranial features of dermopterans and tree shrews, and the differences in dental morphology between picrodontids and car-polestids. As Szalay et al. (1987) note, Grade II (living and fossil "Prosimii"), by including tarsiers, exhibits a patchwork of features present in anthropoids and in more primitive forms. In a modern perspective, with our increased understanding of the primitive nature of early anthropoids (i.e., eosimiids), it is becoming clear that the discontinuities that were thought to separate these various grades were a sampling phenomenon rather than something real, so that even "Grade 3" is no longer really adaptively coherent. This highlights a more general point. The appearance of distinct adaptive groupings in the modern world likely owes as much to extinction or pseudoextinction as it does to evolution per se. As the fossil record continues to improve, the distinctness of such gaps continues to degrade as more intermediates are found. This is true in Primates as in non-primates. We now have, for example, a plesiadapiform with a supposed defining feature of definitive Primates (a divergent hallux bearing a nail; Bloch and Boyer, 2002, 2003, and 2006) and non-avian dinosaurs that bear not only feathers, but multiple wings that may have been used for gliding (Xu et al., 2003). Any taxonomy that fails to allow for the discovery and classification of such intermediates between adaptive "grades" is fundamentally unworkable if fossils are to be classified along with living organisms. Szalay et al. 's (1987) own approach returned to a more phylogenetic methodology, although they explicitly advocated allowing the taxonomic labeling of paraphyletic as well as monophyletic (their "holophyletic") groupings. These authors included plesiadapiforms in Primates and used Hoffstetter's term Euprimates, providing lists of derived characters for the common ancestor of each of the major divisions of the order. In spite of their allowance for paraphyletic groupings these authors' approach, in practice, is most similar to the apomorphy-based technique of definition from phylogenetic taxonomy, in using uniquely derived features to identify the common ancestor that sits at the base of a named group. Figure 2. Wible and Covert's (1987; redrawn from their Fig. 7a) preferred cladogram, allying tree shrews and Euprimates to the exclusion of Plesiadapis and supporting the link between dermopterans and chiropterans (Volitantia). Note that their use of "Plesiadapis" alone, rather than "Plesiadapiformes," reflects both their almost sole reliance on cranial data (well-known only for Plesiadapis and microsyopids at the time they were writing), and their view that "...the affinities of microsyopids remain muddled (p. 18)." applied a similar usage of Primates. In both of these cases the support that the authors saw for a relationship between Dermoptera and some plesiadapiforms made it unnecessary to include any taxa outside of Euprimates in Primates. Beard (1991, 1993a) defined a taxon, Primatomorpha (note that this is incorrectly spelled "Primatamorpha" in Beard, 1993a: Figure 10.2), based on a list of synapomorphies shared by dermopterans, some plesiadapiforms, and Euprimates. This grouping would be consistent with a node-based type of definition, as indicated by the recognition of a comparable cluster by McKenna and Bell (1997), who favor this approach. In this case, however, McKenna and Bell (1997) call the assemblage of taxa Primates, rather than Primatomorpha. The inclusion of Dermoptera in their conception of Primates is interesting in that it would force a fundamental shift in what most contemporary authors think of as the adaptive limits of the order.